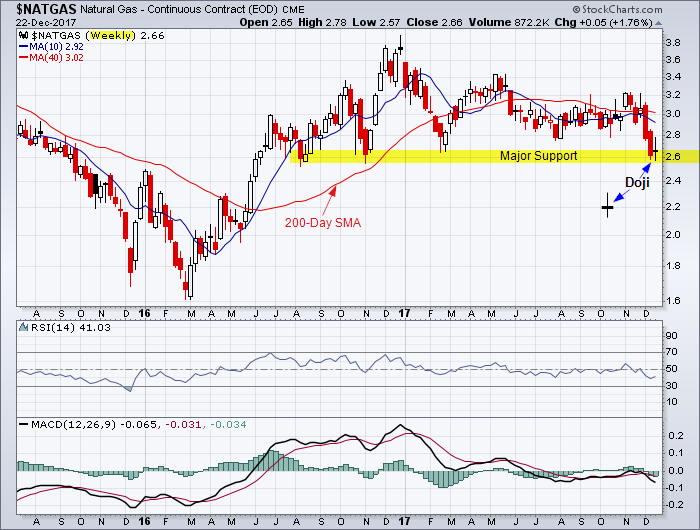 This entry was posted in Commodities and tagged candlestick chart, chart, Doji, Natural Gas on December 23, 2017 by Trader. 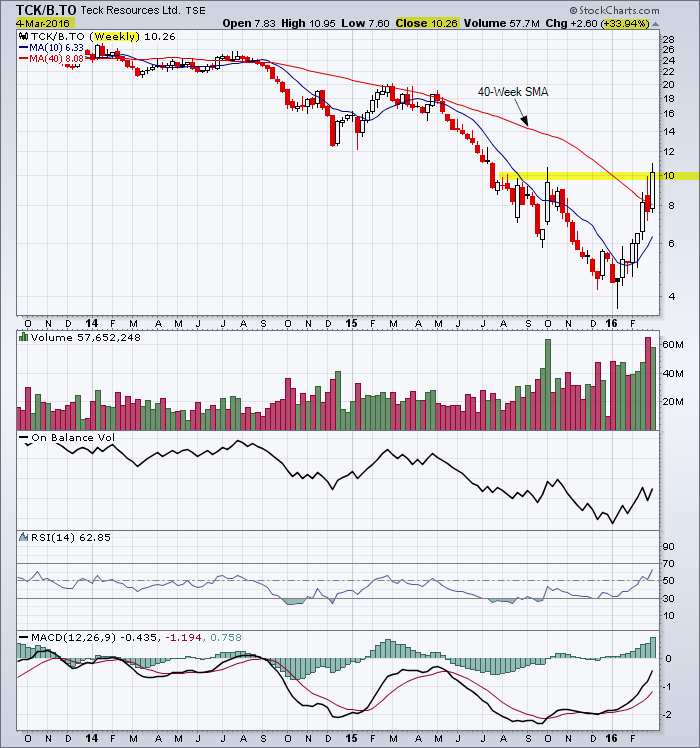 Reference: A view of the weekly chart for Teck Resources showing the major downtrend but an intermediate and near-term uptrend with the $10.00 resistance zone. 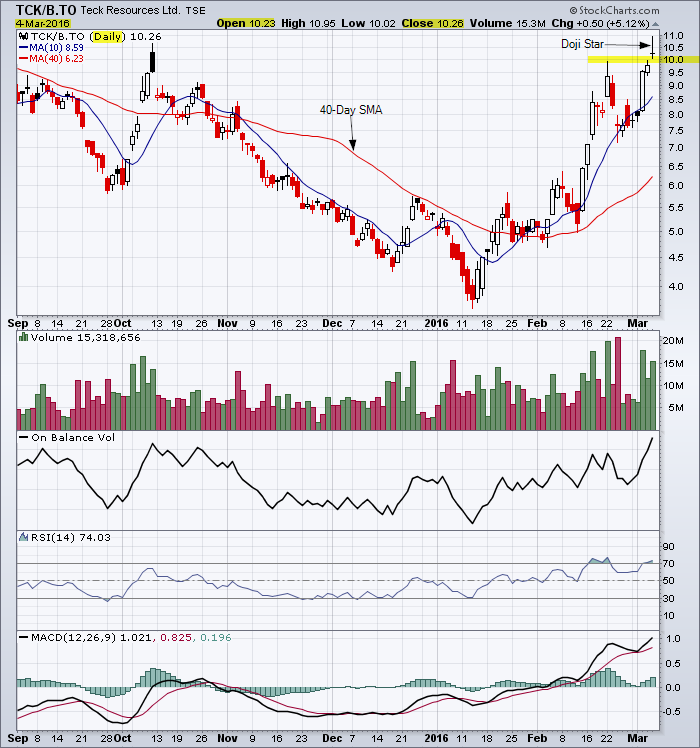 On the plus side: Copper continues to breakout in a near-term uptrend which bodes well for Teck Resources. This entry was posted in Stocks and tagged candlestick chart, Doji, Teck Resources, trend on March 6, 2016 by Trader. Near-term uptrend in S&P 500 halted at 2020. Reference my last chart analysis for the S&P 500. 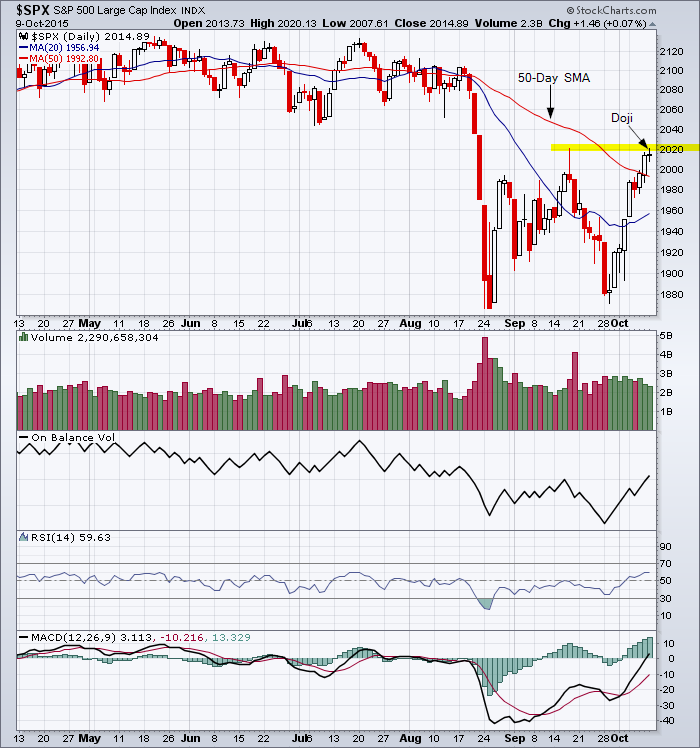 This entry was posted in U.S. Indexes and tagged Doji, resistance, S&P 500 on October 10, 2015 by Trader. I am not surprised to see the gravestone doji on the today’s TSX candlestick daily chart. The doji is a significant reversal indicator. It indicates that the near-term trend that started on Monday has ended at the major resistance level of 13,500. Like I said, this is no surprise. 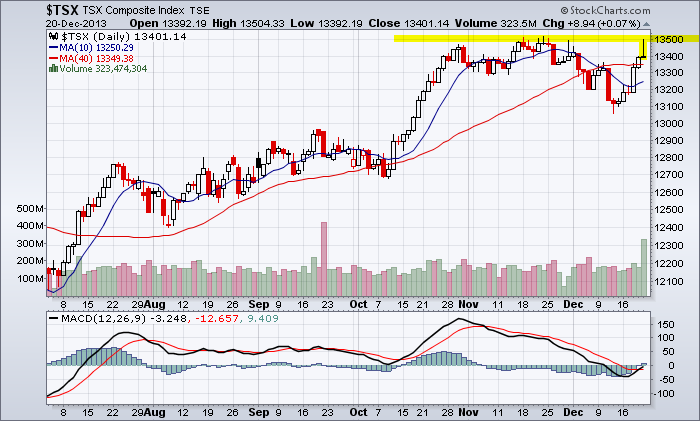 Reference previous posts for the TSX Index showing the 13,500 resistance level. This entry was posted in TSX Index and tagged chart, chart analysis, Doji on December 20, 2013 by Trader. On Wednesday, the TSX Index reached a 52 week high and a tentative breakout above resistance of 12,900. On Thursdays, the doji candlestick showed the indecision of traders. On Friday, traders made their decision. The shaven bottom candlestick shows the sell-off on above average volume. This does not bode well for trading on Monday. Reference the last chart analysis for the TSX Index. This entry was posted in TSX Index and tagged candlestick, chart, Doji, RSI, shaven bottom, TSX on September 21, 2013 by Trader. Can the TSX Index hold the 12,000 support level? 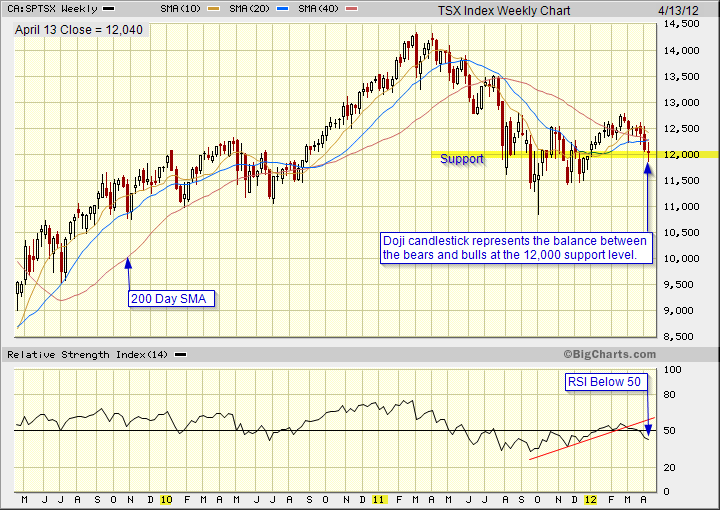 Reference the last chart analysis for the TSX Index posted on April 6, 2012. 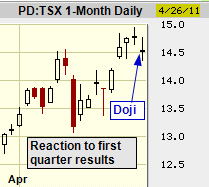 This entry was posted in TSX Index and tagged candlestick charts, Doji, Technical Analysis, TSX on April 13, 2012 by Trader. 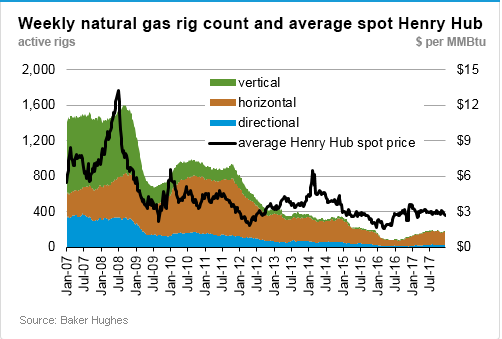 Reference the previous chart analysis for Precision Drilling. Precision Drilling Corporation (“Precision”) intends to release its 2011 first quarter results before the market opens on Tuesday, April 26, 2011 and has scheduled a conference call and webcast to begin promptly at 12:00 Noon MT (2:00 p.m. ET) on the same day. Analysts expect earnings of 26 cents a share. April 26, 2011 Update: The Calgary-based concern on Tuesday posted net earnings of $66 million, or 23 cents per share, for the three months ended March 31. That compared with net earnings of $57 million, or 20 cents per share, in the first quarter of 2010. What will be the reaction on the chart to the first quarter results? That is all that counts. 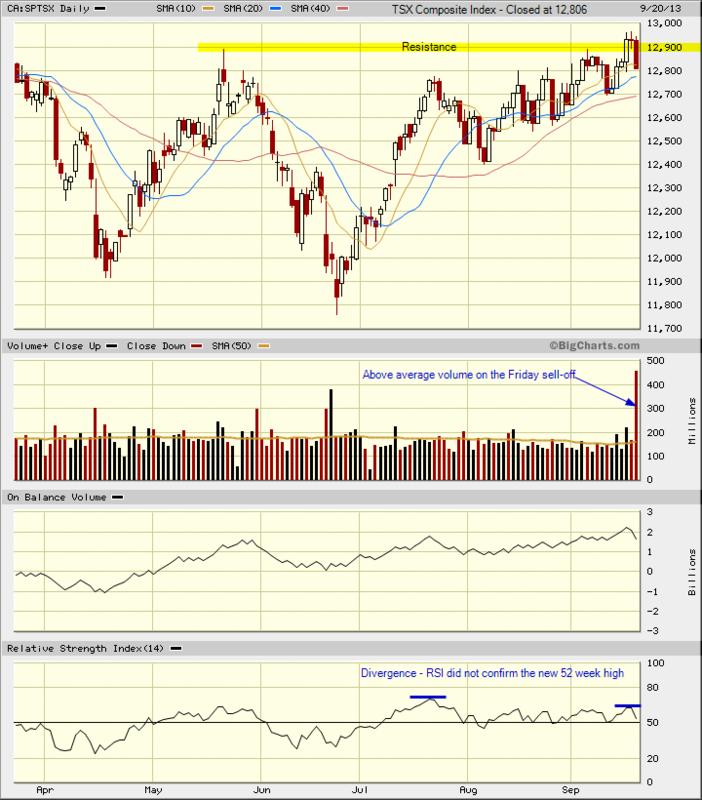 A doji candlestick (opens and closes at or very near the same level) formed on the daily chart at the end of trading for Tuesday, April 26, 2011. This was the reaction of the market to the first quarter results. It represents indecision and a battle between the bulls and the bears. Considering the recent run-up in the stock price, the fact that Precision Drilling stock did not sell off on the earnings miss is a positive reaction on the chart. Set alerts at $15.00 and $14.00 and monitor for the development of a consolidation pattern. The doji candlestick has the same opening and closing price. 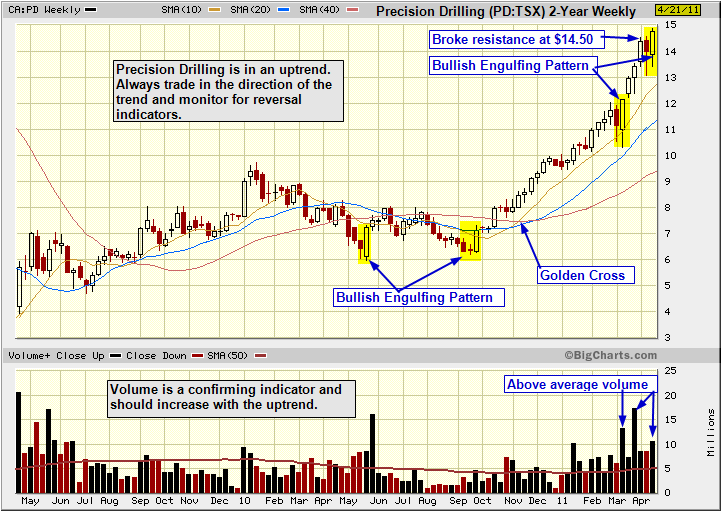 In the Precision Drilling chart to the right, the doji is part of a consolidation pattern. But, the doji is an important candlestick especially for indicating tops. As in all technical analysis, you have to look at the total picture before making a decision based on one candlestick formation. Always look at the price action the next day to corroborate any pricing pattern. This entry was posted in Stocks and tagged Bullish Engulfing Pattern, Doji, Precision Drilling on April 24, 2011 by Trader.